Take Exit #142 (US-127 South / Hudson exit). Take US-127 South to the 3rd exit, which is South St.
At the very first light turn RIGHT onto E. High St.
Take E. High St. north about 1 mile to Research Drive. 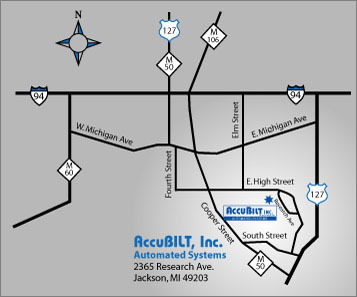 Turn Left onto Research Drive and AccuBilt is the 2nd building on the right side.